The inventor of the infamous AK-47 assault rifle has backed stricter gun controls as a key small arms conference gets under way on Monday in New York. Mikhail Kalashnikov said he backed UN moves to halt the illicit distribution of small arms. The Control Arms campaign will hand a petition to UN Secretary General Kofi Annan at the start of the two-week Small Arms Review Conference. 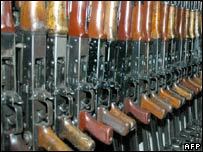 The campaign's report says there are about 100m AK-47s and variants in use. It calls for a new international treaty to apply "global principles" to the sale of arms. 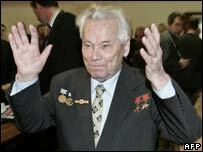 In giving his backing to the Control Arms campaign, Mr Kalashnikov said: "When I watch TV and see small arms of the AK family in the hands of bandits, I keep asking myself: how did those people get hold of them?" The retired general, who invented the rifle in 1945, blamed a "lack of international control over arms sales" for allowing the weapons to fall into the hands of "aggressors, terrorists and all kinds of criminals". The campaign's report, produced by Amnesty International, Oxfam International and the International Action Network on Small Arms said the AK-47 was the world's most poorly regulated small arms weapon. It says 82 countries have them in their state arsenal and 14 nations manufacture them. The rifle fires 600 rounds a minute, is reliable and available for as little as $30 in some parts of Africa. The campaign's petition has one million signatures from 160 countries - representing the number of people killed by guns since the last UN conference on small arms in 2001. Its report says light arms are killing 1,000 people a day. The "global principles" that the campaign proposes would be non-binding, but would allow governments to bring violators to account more easily. The UK has made a similar proposal and has the backing in principle of the US and others. But US Ambassador to the UN John Bolton made it clear Washington did not want to go beyond a programme adopted five years ago to curb the illicit sale of light weaponry. "We don't see any need for treaties or agreements coming out of this," he said.